Mangaluru: Deamanding to to construct Ram Mandir in Ayodhya the Vishwa Hindu Parishad organized ‘Bhrahat Janagraha’ at the Nehru Maidan here on November 25. Sri Vishvesha Teertha Swamiji of Pejawar Math, Sri Rajashekarananda Swamiji of Vajradehi Math, Sri Gurudevananda Swamiji Gurudevadatta Samsthanam, Odiyoor, Sri Mahabala Swamiji of Kaniyoor, Karinje Sri Muktanand Swamiji, Sri Vidyanand Saraswati Swamiji of Om Sai Math rise the voice to build the Ram Mandir on the occation. 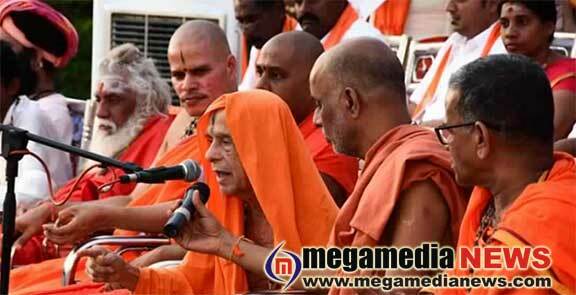 Udupi Pejawar Mutt Sri Vishweshwa Theertha swamiji said, Ram Mandir will be constructed at Ayodhya at any cost. Union government to pass a suitable law to ensure construction of a Ram Mandir in Ayodhya. I am sure that in the year 2019 the process for the construction of Ram Mandir will begin, he said. National Bajrang Dal convenor Sohan Singh Solanki spoke on the occation. MP Nalin Kumar Kateel, MLA Vedavyas Kamath, Dr Bharat Shetty, Umanath Kotian, Sanjeev Matandoor, VHP leaders Sharan Pumpwell, Jagadish Shenava, Kalladka Prabhakar Bhat, Prof M B Puranik, Krishnamurthy, Sharan Pumpwell, Sunil K R, Bhujang Kulala, Muralikrishna Hamsathadka, Dr Krishna Prasanna, Gopal Kuthar, Shivanand Mendon, Sathish Puttur, Praveen Kuthar, Sridhar and others were also present. District President of VHP Jagadish Shenava welcomed the gathering. A huge procession taken off from Ambedkar (Jyothi) Circle around 50,000 people from Puttur, Sullia, Beltangady and Kasargod.